Alex Boneham and an attentive Sarah McKenzie at Stonnington Jazz opening night. It was a perfect setting for deja vu. 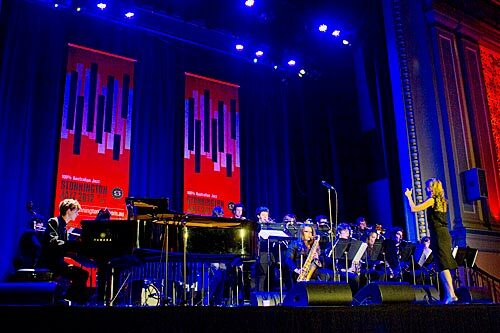 It was the opening night of Stonnington Jazz, the venue was Malvern Town Hall, patrons were seated nightclub-style at tables across the dimly, but beautifully lit auditorium, and festival director Adrian Jackson was at the microphone. Sarah McKenzie was soon seated at the piano. 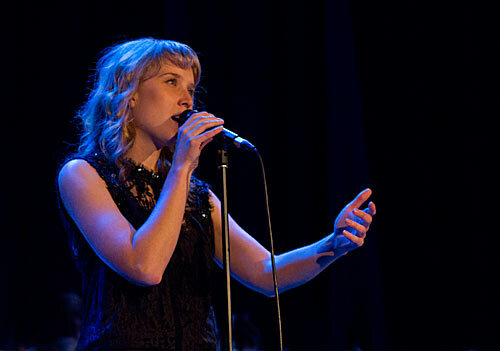 It could easily have been a year earlier when the young singer opened Stonnington Jazz for 2011. But somehow the deja vu never arrived. This was different. 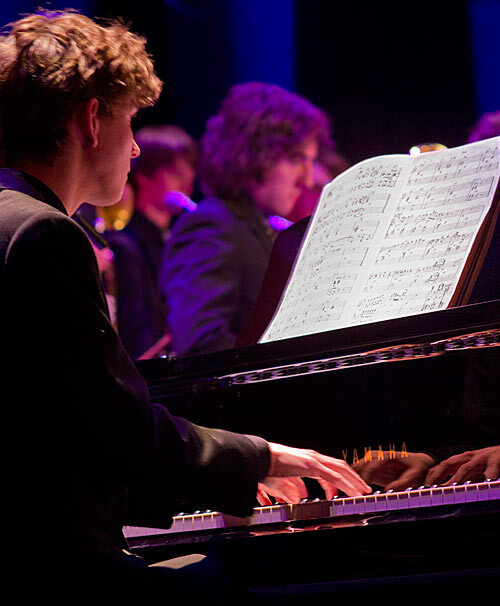 The big difference, of course, was a big band — the Generations in Jazz Big Band composed of talented young musicians nurtured by the esteemed saxophonist Graeme Lyall at Mount Gambier in South Australia. This band made a substantial difference not only because of their excellent musicianship, but because they altered the dynamic. Right from the start McKenzie was not just the performer on piano and vocals with her quartet of Hugh Stuckey on guitar, Alex Boneham on bass and Craig Simon on drums. She was now McKenzie the arranger and composer and musical director of a band, albeit in close collusion with Lyall. And from the start of this gig McKenzie was alert and attentive to what the band was doing — doing very well indeed. With quartet and band, McKenzie performed The Wind Cries Mary (Hendrix) and At Last (Gordon/Warren), before giving us two numbers with the quartet and vibes — her take on Big Yellow Taxi (Mitchell) and Don’t Get Around Much Anymore (Ellington). But the highlight of the first set gave us a chance to see McKenzie sans piano and sans vocals in the role of composer and band leader. Two things made this number special for me. First, Song for Maria was McKenzie’s tribute to American arranger, composer and big band leader Maria Schneider, of whom I’m a huge fan. This composition really worked well and really blew away any cobwebs of deja vu — we were seeing and hearing a new dimension to McKenzie as composer. Second, McKenzie handed the piano keys to Shea Martin (I hope that name is correct), who did credit to her work in a considered and compelling performance. Graeme Lyall appeared to lead the band as the second set opened with Look For the Silver Lining (Kern/DeSylva). It was obvious that Lyall has these young players well rehearsed and responsive. But, hey hey, some antics were about to begin. There was no sign of an ostrich, but who should suddenly pop up but the inimitable showman Daryl Somers, who is a patron of the Generations in Jazz Program. He put the audience through its paces with some singalong. 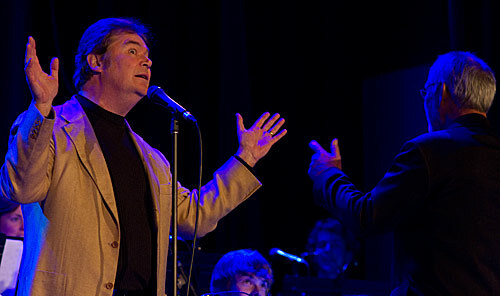 No ostrich: Daryl Somers pops in to Stonnington Jazz. McKenzie returned with the quartet for her version (“I can’t play a standard in a standard way”) of Nat King Cole’s Too Young, followed by Don’t Tempt Me, an original and the title track from her first album. The second album, Close Your Eyes, will be released soon. It should be said that the work of Stuckey, Boneham and Simon was exemplary, and Stuckey’s contribution on guitar in particular was appreciated by the crowd. It was about now that it seemed McKenzie really started to hit her straps. I had the feeling she was just getting into her stride. Saying that she always tried to “do one dangerous thing every day”, she again handed the piano to young Martin and took the mic to perform only vocals in Irving Berlin’s Blue Skies. 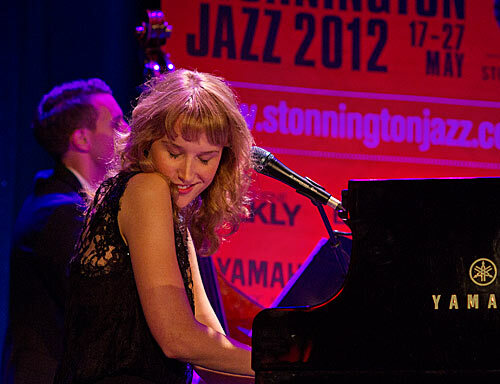 Shea Martin on piano at Stonnington Jazz. I loved the work of the band, the pianist and Boneham’s bass in this piece, and again it was excellent to see McKenzie being a little dangerous. One dangerous thing: Sarah McKenzie without piano. But the singer returned to the piano for her most powerful number all night, an original blues titled Living Room Blues. I think McKenzie really felt relaxed at this point and could have gone on. She seemed to be just warming up. But the night ended with her alone at the piano for the ballad I Should Care. 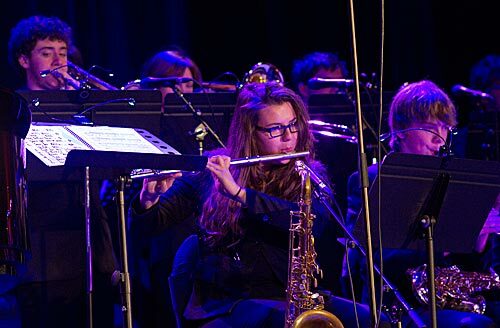 It was a great festival launch, but more importantly it was a chance for McKenzie — with a huge dollop of help from Graeme Lyall and the big band — to show her potential as an arranger and composer. 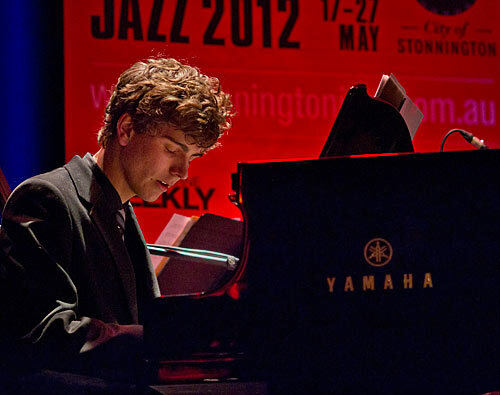 And there is much hope for the future of Australian jazz with young musicians being given such a great start. 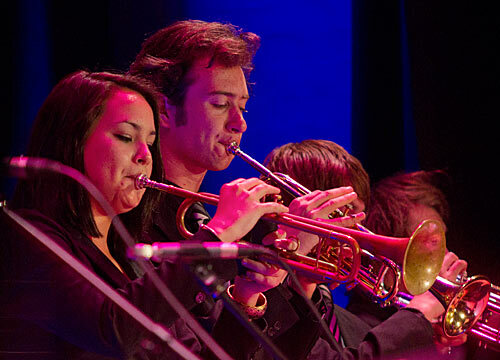 At the opening of Stonnington Jazz 2012, the deja vu that might have happened was never missed. 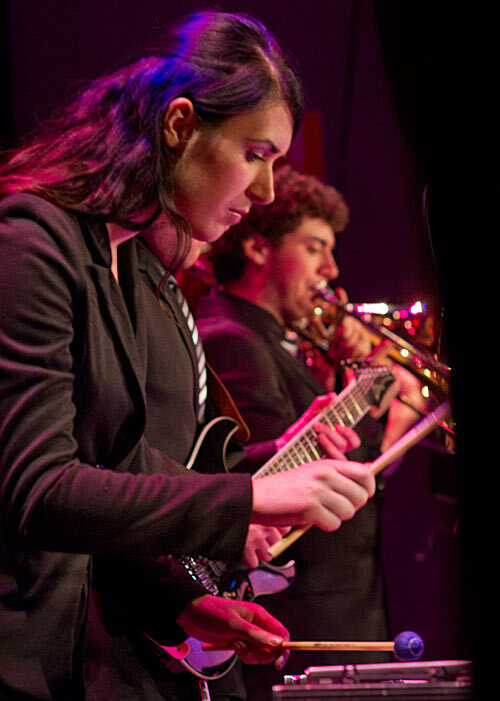 This entry was posted in STONNINGTON JAZZ 2012 and tagged Alex Boneham, big yellow taxi, Craig Simon, graeme lyall, Hugh Stuckey, mount gambier, Sarah McKenzie, Stonnington Jazz, Stonnington Jazz 2012, young musicians. Bookmark the permalink.